The Parties That Cook Blog has seen some wonderful guest posts in the past. We’re going to keep the tradition going with a recap of the most recent cookbook club meeting from our Chicago office! This installment of our Chicago Team’s Cookbook Club is brought to you by Chefs Heidi, Brandy, Liz and Molly. Thanks ladies! After having to reschedule our book club due to the great snow storm of 2011 that hit Chicago a few weeks back, the PTC girls gathered at Brandy’s house. We were all very excited to review the book, Chicago Cooks: 25 Years of Chicago Culinary History and Great Recipes from Les Dames d’Escoffier. Unfortunately, our enthusiasm was quickly deflated. 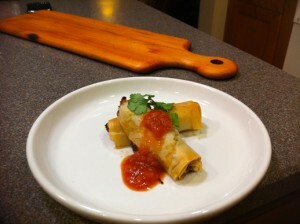 We started with Heidi’s choice for the first course: Spicy Crab and Shrimp Rolls with Salsa. This was probably the best recipe that we reviewed because it was fairly easy and the flavors were quite good (paprika, saffron, cayenne and cumin). We often wondered if the recipes had been tested because the cooking times were incorrect on several recipes. It took longer to cook these than the recipe indicated. Heidi also suggested doubling the cooking liquid and reserving it for dipping the rolls which would have been much better than a jarred salsa. 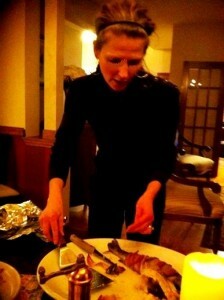 For our entrée, Brandy made Hickory Smoked Bacon Wrapped Rainbow Trout. This was a very simple recipe. The whole fish was stuffed with rosemary and wrapped in bacon. It was difficult to serve, but thanks to Molly and Brandy’s fabulous filleting abilities, we managed to plate it up. This is definitely not the recipe to serve when you want a beautiful presentation. We all agreed that it may have been easier to fillet the fish before cooking and wrapping each individual piece with bacon. 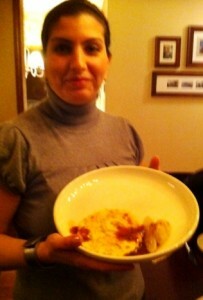 Alongside the fish, we served Liz’s Onion Flan. This recipe was completely off on yields and cooking times. 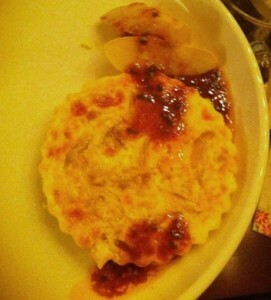 Aside from that, it was your basic egg custard dish – similar to a quiche. For dessert, Molly, our resident pastry Chef, made a decadent Chocolate Hazelnut Cake. We were all very impressed when Molly unveiled her cakes. They were worthy of sitting on the shelves of the finest bakeries in town. Molly later confessed that she dolled up the cakes that otherwise would have looked like hockey pucks (literally). She added a lovely Raspberry Buttercream, Raspberry Sauce, fresh Raspberries and a chocolate disc that she brought back from her recent trip to Switzerland. The cake recipe from the book was good, but Molly’s additions elevated it to 5 star restaurant quality! It was a decadent but surprisingly light dessert. To quote some of the girls, “It didn’t feel like a gut bomb”. I think we all agreed that this Chicago Cooks book didn’t “cook” up enough interest to merit a purchase. Though not every cookbook reviewed is a success, this doesn’t stop us from wanting to try more in the future! 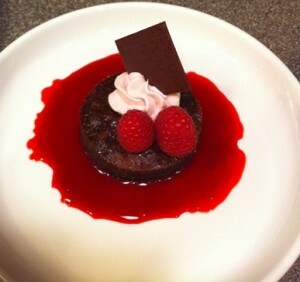 Look out for the next guest post of Parties That Cook’s Chicago Cookbook Club! For more ideas on cooking parties in Chicago, or for hands-on cooking classes in Chicago, you know Parties That Cook is your go-to company! We approach our work with an innovative spirit, seamless attention to detail and a passion for food & entertaining. Team Building Done Right. How does it work? For more great recipes click here. Looking to Host a Cooking Party?